Image: Alexander Tamargo/Getty Images, Dave Benett/Getty Images for Triumph Motorcycles. It looks like timing is not on Christina El Moussa and Ant Anstead's side this week. After spending a glorious week in Hawaii with their kids, paddleboarding, drinking out of pineapples and hanging on the beach, the couple's plans to leave on Thursday hit a big snag. With Hurricane Lane barreling down on Hawaii and flights growing more and more scarce by the hour, El Moussa and Anstead found they were going to have to play the waiting game if they wanted to get home before the hurricane actually hit. The group attempted to catch their scheduled flight on Tuesday, but according to El Moussa's Instagram post showing her and four very weary-looking kids (El Moussa's two, Brayden, 3, and Taylor, 7, and Anstead's two, Archie, 12, and Amelia, 14), they all missed their flight. "First time I have ever missed a flight," El Moussa wrote. "Hurricane traffic and a visit to urgent care were the culprits. And with 4 kids in tow. I guess Maui wasn’t ready for us to leave." First time I have ever missed a flight. Hurricane traffic and a visit to urgent care were the culprits. And with 4 kids in tow 🙄😫. I guess Maui wasn’t ready for us to leave. 🏝 . If you're wondering about the timeline, it looks like the group left the airport on Tuesday and found a spot to hang out before returning to the airport on Thursday to see if fortune was on their side. As it turns out, it was — sort of. According to another update from El Moussa on her Instagram (who seems to have posted once she landed back in California), Anstead made a gentlemanly show of love by letting El Moussa, Taylor and Brayden get the first available flight back while he and his kids stayed behind to catch the next flight. El Moussa clued her followers in on the heartwarming turn of events, writing on Thursday night, "Love this man!! … we couldn’t get a flight out of Maui for 6 of us so @ant_anstead insisted me and my kids take the first one. Ant and his kids fly out at 9 pm." 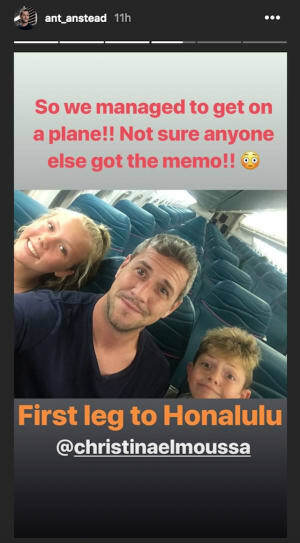 After seeing El Moussa and her kids off safely, Anstead took to his Instagram Story to post updates for his fans about his own journey to get himself, Amelia and Archie back to California. 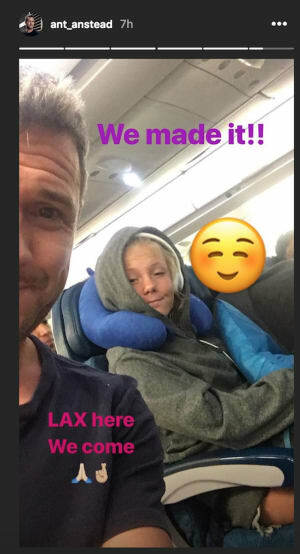 While there were still delays, the Anstead clan finally got on a plane and made their way home. More: Which British Royal Gave Christina El Moussa's New Man Dating Advice? So, what did we learn from this entire ordeal? Well, for one thing, be careful not to plan a luxurious vacation when a hurricane is forecasted to roll through the islands. Also, if you do find yourself stuck like these lovebirds and their respective kids, then maybe do something chivalrous, like Anstead did, and earn some good karma in the process.